Newberg, Oregon is the gateway to the Yamhill Valley wine country, which is the premier Pinot Noir location in the world. Oregon Pinots regularly surpass France and California; they make a native Oregonian like me proud. Good wine cries out for good food, so allow me to introduce you to one of my new favorite restaurants – Recipe. Recipe is housed in a former farm style house, they serve wonderful creative food, with local wines – what more could you ask for. Much of the produce is grown a block away in their middle of town garden. They are committed to local whenever possible, produce, meat, baked goods. Even the dining tables are reclaimed local barn wood. One of my best recommendations for good eating is to let the server choose, Andrew, the front of the house manager, brought me crispy duck. How could he know duck is always a hit with me? When you go be sure to ask for advice on which wineries to visit. Andrew told us about Penner-Ash, which we fell in love with, planning to go back for a dinner in April. It has always frustrated me to spend an hour cooking only to have the meal over in 20 minutes, thus I have become obsessed with small plates and courses. We have small bowls in 2 or three sizes, which work great for veggies and small soups, square plates of 4” and 6” sizes for salads and mains. The eye appeal immediately adds a bit of class to even the most simple of fares. Small dinnerware invites small portions, health advantages aside it is more enjoyable to sample multiple tastes in sequence; the midweek meal is transformed into a special event without a lot of effort. If you are cooking alone, then a glass of wine, good music, and a good meal is well earned pampering after a long day. If you have a friend or spouse to join you there is no better way to unwind and connect. A simple menu: Tenderloin, Ramekin Mash, and salad with blue cheese crumbles, balsamic and olive oil- takes about 30 – 40 minutes to cook. This side dish is a cross between garlic mash and herbed Yorkshire pudding. It goes well with steak or prime rib, the juices only add to the flavor. The best part is how easy it is. Spray ramekins or small tart pans with oil. Boil a medium Yukon Gold potato, mash with butter, milk and lots of garlic. Make a batter with flour, egg, milk, salt, and herbs, most any would work, as to how much, well when it comes to herbs if you have to ask you just don’t get it, some is the appropriate measure. The batter should be the consistency of pancake batter. Place a small amount of a batter in the bottom of each pan (a tablespoon or two). On top of the batter place a small pile of garlic mashed potatoes (I am convinced that most any combination of root vegetables and or squash would only enhance the flavor). Then pour a bit more of the batter around the mash. It is ready for the oven. Serve with an easy drinking red wine. Eat the salad after the main as the French might do. If you are feeling decadent some dark chocolate with a Tori Mor Port rounds the evening out well. Food and cooking is one of the great blessings we have, the secret is to make it fun, share it with someone you love, and take your time. A good story = good writing. When it comes to novels; good writing = a good story. I read about half of The River Why, by David James Duncan, which was highly recommended by a friend. The writing is creative, the metaphors are intriguing, and the descriptions colorful. Yet my interest waned because the story did not grab me, I plan to finish the book, and may change my review, but half way in it is dragging. Most literary types were critical of Harry Potter, a kids book that they said was not well written, yet I read them all, most more than once. Why, because they are good stories. At social gatherings the topic often drifts to books and good writing, many proclaim judgement on the writing, good or bad, assuming that all present are cognizant of what they mean by good writing, usually I don’t have a clue what is meant. And often the books I have enjoyed most are deemed barely worth reading because they are “not well written.” All I know is that I enjoyed the story. Most of my reading is for work or study, I read novels for pleasure, to escape. A good Louis L’Amour western fills the need quite often. They are good stories therefore they are well written. Stir-fry is a quick cooked meal composed of a variety of often disassociated fixin’s, that all come together end the end. Such was our weekend. 10.00am Pick up rental car, load Alexis’ stuff into her car. 11.00am Total Wine and More in Tukwila, shop, taste, buy. Noon – 1.00pm At airport to pick up Alexis, she was arriving from Bangladesh, via Dubai. Drive to Newberg arriving at 4.35.pm, we dropped her off and helped her unload. Tim and Cheri’s at about 5.35pm, wonderful evening of roasted chicken, green beans, fireplace, good music. After a fruitless search for a latte, I found one at the hotel. Tim picked me up at 7.45am for coffee at the Red E in Portland. We met up with Tricia and Cheri at about 9.30 then headed to breakfast at a funky, odd, car themed diner- Beaterville – I had the “Mini Cooper” – scrambled eggs with pepper-jack cheese, potatoes, biscuits and gravy. At 11.30am we got to Adam’s house, my son. He wanted us to eat frozen pizza which we did, just to not offend. We left for Seattle at 1.00pm. What a weekend, yet it all worked out great, we saw Alexis, Adam, and our friends all in the same weekend. We had some great food, and probably too much Scotch. But it was a wonderful time. Sometimes the crazy just works. 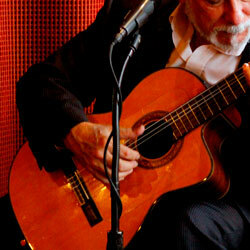 The best part of Tablas Woodstone Taverna in Mill Creek, WA is the live Flamenco guitar. It is not a bad place, but as a frequent visitor to the sister restaurant, Dimetri’s in Edmonds, WA, I was expecting a lot more. We had a good experience, but based on our history with Dimetri’s and recommendations from Mill Creek locals it was not what I hoped for. The Tablas decor seems a bit worn, sitting in the lounge you get the wonderful view of a messy bar, if you are going to have seating that allows patrons to see behind the bar then it is important to keep it meticulously clean, this was cluttered. The view toward the kitchen/server station was just as unappetizing The food was good but then again not up to Dimetri’s quality, though I did enjoy the grilled sardines. Most disappointing was the wine list, I know this is a Spanish theme, but please, we live in Washington, have at least something local on the list. I loved the music, Flamenco is a weakness of mine, so that made it better, as did the bartender who was a pleasure. Thank God for taste buds! Sometimes great meals are easy meals. For a great steak my fallback is so simple – olive oil and garlic salt. People rave, and it is so easy. 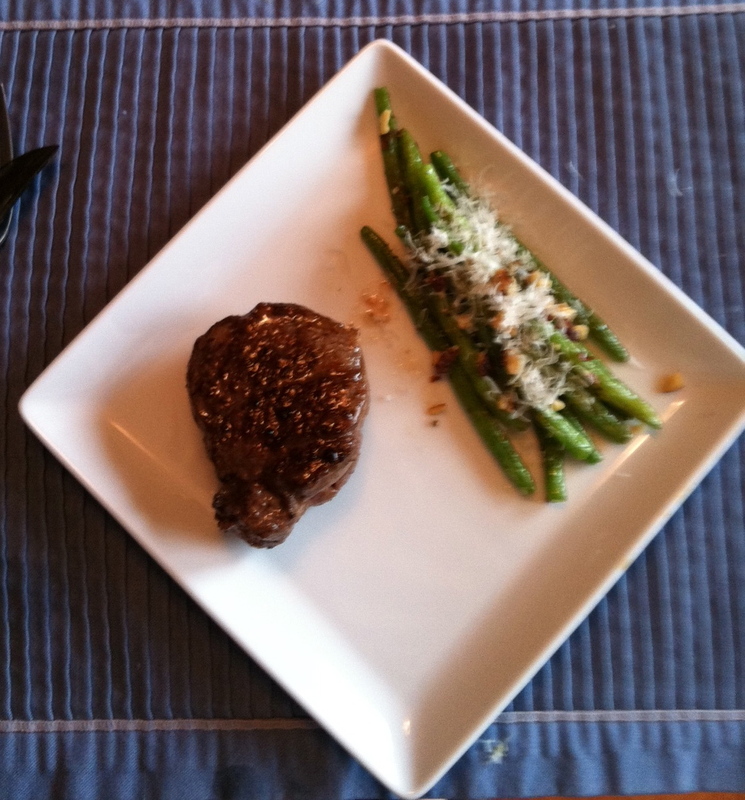 This meal was a tenderloin, along with green beans that were sautéed with hazelnuts. Steam the beans, then sauté in olive oil, garlic and rough crushed hazelnuts, then sprinkle with parmesan cheese. 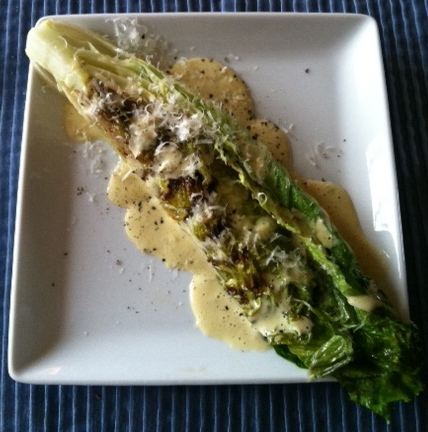 The second course was a grilled Cesar Salad. I wish I could take credit for the recipe but I found it at a blog site “the Little kitchen” and it is one of the best I have ever had, as well as a simple one.